Are you ready to make your home theater dream a reality? At Texas Info Media, customers often come to us with that dream, but also with plenty of skepticism. Folks simply can’t comprehend how they can transform a particular room into a luxury home cinema. 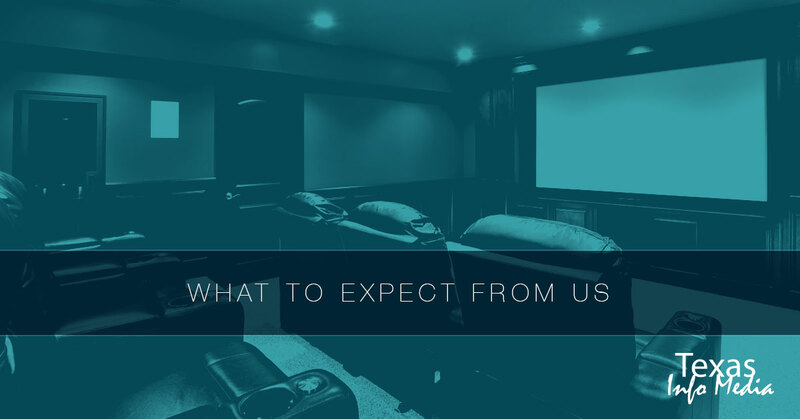 In this blog post, we will explain how our home theatre design specialists get it done. First of all, it’s important to point out that we put the utmost importance on custom. Take a moment to picture the best home theatre system that you’ve ever seen. Maybe you see comfortable reclined seating or luxurious lighting, for example. We take great pride in putting together a customized, professional home theater installation for homeowners with all different kinds of budgets. We start out by working with you to create the best home theater setup imaginable. During this time, we can show some home theater project portfolios to help jumpstart inspiration as well as listen to your ideas and take notes. Keep in mind, however, that this is your project from start to finish. Our home theatre design team has definitely been there and done that, but we never try to replicate a project. We strive to make your luxury home cinema the most enjoyable space in your home, which is why we never follow a ‘one-size-fits-all’ model. Following the initial consultation, we work with our professional designers and architect to create a computer-aided design and drafting (CAD) rendering of the floor plan and project as a whole. Taking this step allows us to have an accurate project quote in mind. As we move through the drawings and design, it’s important that you provide us with any suggestions. Rest assured that our flexible staff will work through revisions so that we’re squared away with a design that exceeds your expectations. Texas Info Media will also connect with other contractors who may be working with us in order to make the scheduling as easy as possible. Let’s say that you’re having some people over to your home to watch a movie in your current home theater. But because the system was installed years ago, you are required to use multiple remotes to make certain that everything works the way it should. That doesn’t need to be the case, anymore! Texas Info Media understands that calibrating the various pieces of equipment together is essential to the overall success. When you trust us with your home theatre design, we take the pain out of technology for homeowners. The luxury feel is what makes our projects the best home theatre systems in the world. With professional home theater installation from Texas Info Media, you don’t just get a home theater that you’ll use from time to time. Rather, you’re treated to a high-end home theater system that will blow you and your guests away. The project may be complete at this point, but we aren’t done quite yet. Our friendly, knowledgeable staff will walk you through your new home theater with an easy-to-follow demonstration. We will show you the different components, how they sync, as well as where you can find your favorite features to ensure you are the master of your own theater and not the other way around. For more information about Texas Info Media or to schedule your initial consultation, call us today.